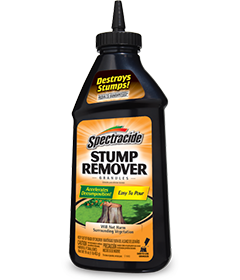 Spectracide® Stump Remover Granules speed the decomposition of the stump, making it porous. Once the stump has become porous, it may be easily removed or burned. The decomposition, depending on the size of the stump, may take several weeks or months. Prior to using Spectracide Stump Remover Granules, freshly cut stumps should be killed with a brush killer. This product works best when weather is warm and stumps are dry. THIS IS NOT AN INSTANT PRODUCT. IT IS AN AID TO NATURAL DECOMPOSITION. To remove stumps, drill several 1-inch holes up to 12 inches deep into stump. Then into the side of the stump, approximately 3 to 4 inches from the top, drill a 1-inch hole slanting down to connect with the bottom of the center hole. Pour approximately 4 oz of Spectracide Stump Remover Granules into each hole. Then fill with hot water to dissolve the granules. Continue to add water to the holes for several days to ensure Spectracide Stump Remover Granules dissolve completely. Allow the decomposition process to take place for four to six weeks before removing the stump. In areas where burning is allowed, light a fire on top of the stump with charcoal briquettes. The heat created will be carried throughout the stump. The stump should smolder down to the roots until only ashes remain. Do not burn stump if it is next to any structure. WARNING: CONTAINS POTASSIUM NITRATE. Harmful if swallowed. If swallowed, give one or two glasses of water or milk and call a physician. Avoid contact with eyes, skin and clothing. Should contact occur, wash with plenty of water.